Welcome to the World’s Greatest Composers Study Volume 1! 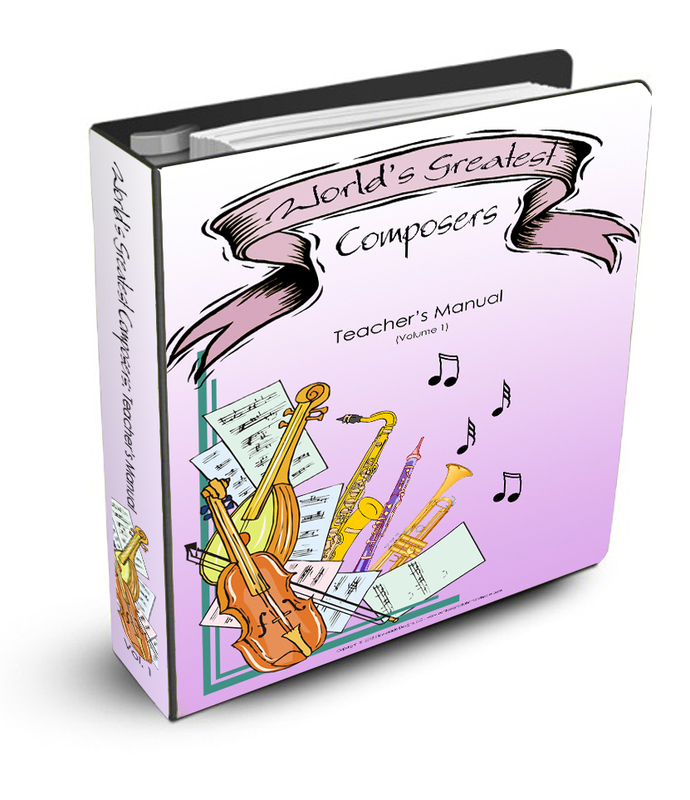 Get the World’s Greatest Composers Study! 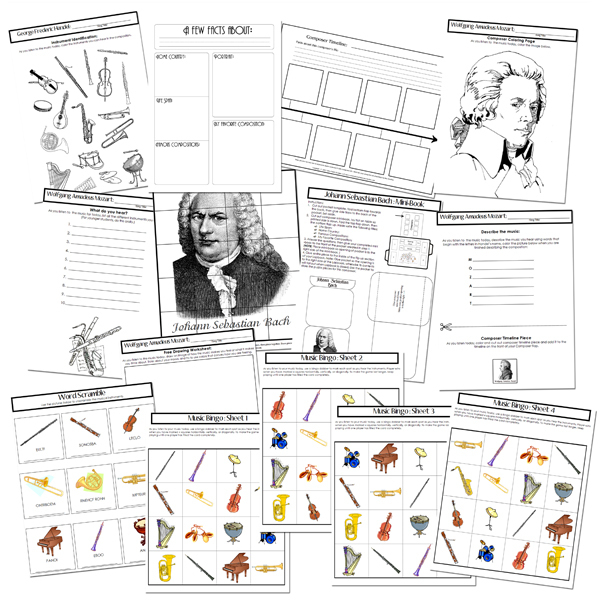 In this series of studies, we will be taking a look at 8 of the world’s greatest composers through a study designed for elementary aged students. The goal behind the World’s Greatest Composers curriculum is to immerse students in the work of each composer so that they are well familiar with their style, methods and music. Much of your time studying will be through open discussion with students and listening to compositions. 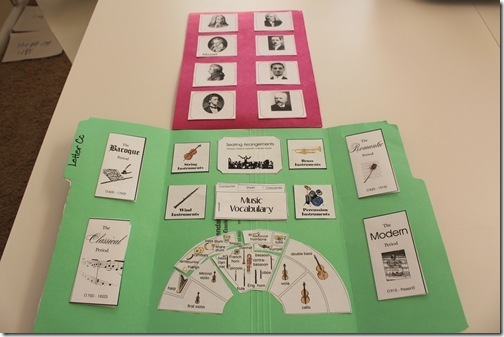 Upon completion of this curriculum, your student should be able to easily recognize the pieces from each composer studied. They will also have learned several different styles of music, vocabulary, as well as have gained an appreciation for music in general. 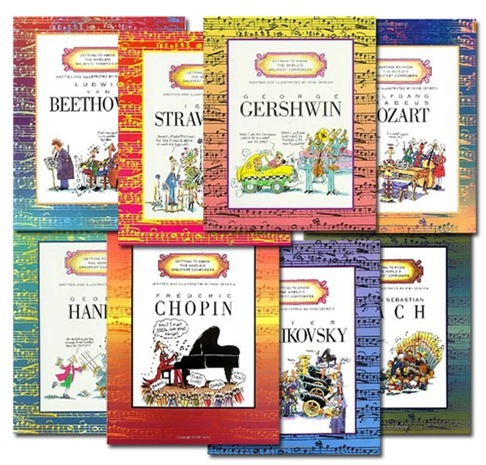 Like the World’s Greatest Artists study, the composers study uses the World’s Greatest Composer Series by Mike Venezia. For each day of listening there is an activity for students to complete while listening. This will help them focus on the music, and think critically about what they are hearing. By the end of the study, your student will have a completed composers notebook along with an orchestra and music lap book. 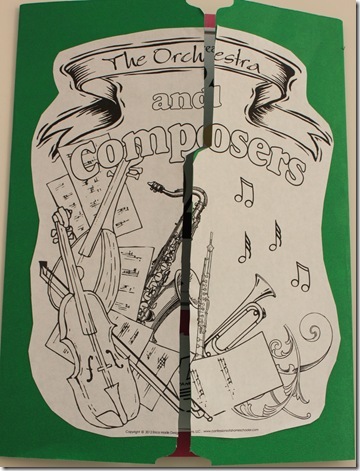 Each composer unit has 10 lessons, I suggest scheduling 2-3 days per week for the composers study. The curriculum will take 1 full year to complete at this pace. However, the lessons can be easily adapted to fit your schedule as well. Each lesson consists of a listening assignment along with an activity to help your student focus on what they are hearing. 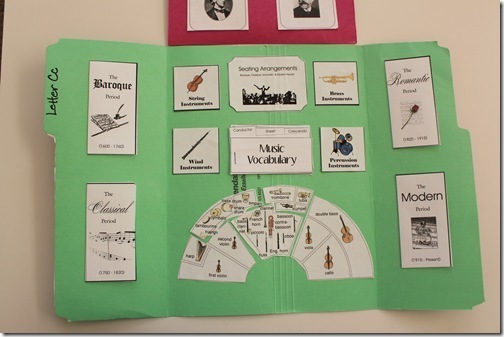 You will want to have your student materials ready prior to starting each lesson. An internet connection is required for the listening portion of the study, so I suggest setting up a laptop or computer near your student work area. An alternative would be to purchase CD’s or songs via iTunes from each composer. 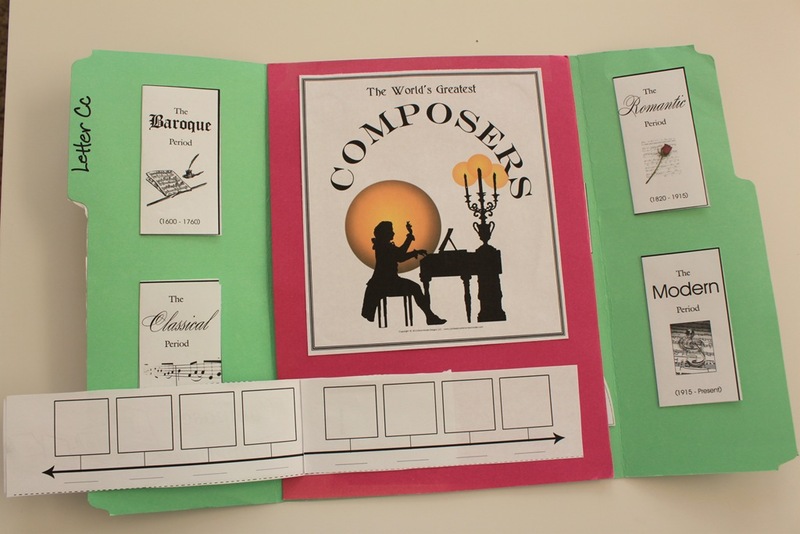 As you progress through each composer your student will be creating a fun lap book to help them remember what they’ve learned. You will need 2 file folders for each lap book you need to create. Instructions for assembling the lap book are included in the curriculum. 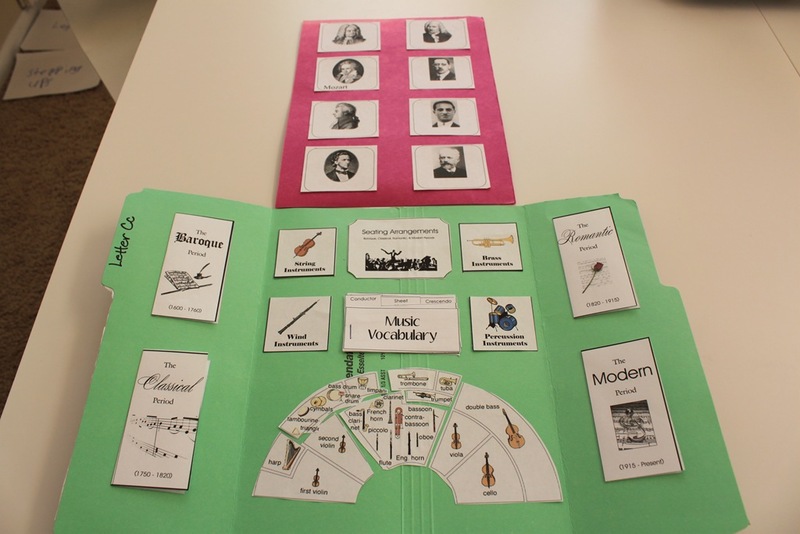 Students will learn about the Baroque, Classical, Romantic, and Modern eras of music, as well as create a composer timeline. They will also learn about all of the different instruments, their sounds, roles, and seating positions within the orchestra. 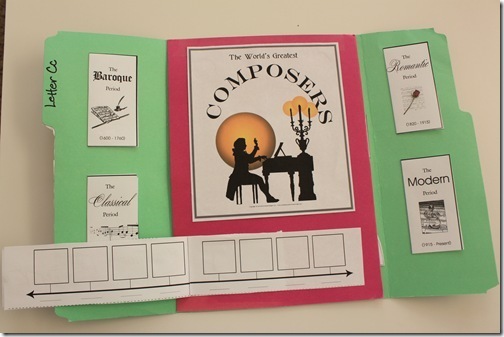 As you progress through the composers, you will create mini-books for each composer along with notebook pages as well as a fun puzzle with a pocket to store your pieces in. Sound like fun? Ready to get started? I’ve had so much interest, I’ve decided to give away a free World’s Greatest Composers Study to one of you! Can’t wait? Buy it now AND enter to win, and I’ll REFUND your purchase cost if you win! Simply leave a comment below letting me know why you’d like to win a free registration for your family! The give away will be open until midnight EST Friday February 3, 2012. Winner will be announced by Sunday February 5, 2012. Disclosure: I wrote this and am providing a free copy to giveaway on my blog. The opinions I have given are mine and may differ from others but were not influenced by the company or the free product provided. Looks great…is the idea that I would also buy the amazon books for each composer? Also, is the actual music included somewhere on a cd or would I source that elsewhere? I’ve been wondering how to do this, beginning in fall, and there are some very tempting and helpful ideas here. Did you ever find out if you needed the books? I just came across this program and saw your comment! This looks fantastic. Thank you for making it!! This looks great and looks like a lot of fun! You are so creative Erica! I was wondering since you have done Expedition Earth in the past and are working through Road Trip USA this year. What history are you going to do with the kids next year? I didn’t know if you were working on another program or were going with something else. Thanks! This looks fantastic, can’t wait to use it !! I would love to win it for my little guy !! This is our first year homeschooling and there are so many ideas to choose from. Currently we are not doing any music, mainly because I had no clue what to do. I think this would be a great addition to our curriculum!! We have discovered that we really enjoy making lap books, so I think my girls would really enjoy this! This looks like a great study. Just yesterday I was wondering how I can bring more Music to our studies this is a great Solution!